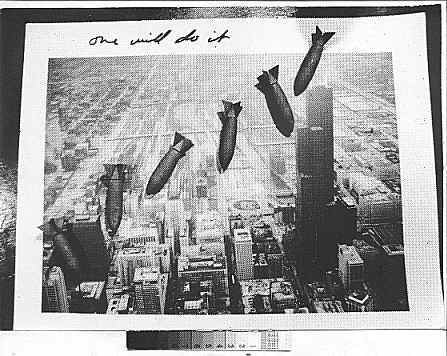 The Chicago Tribune once printed a map showing what would happen to Chicago if a one-megaton bomb were to fall at State and Madison. It made you feel safe to live north of Touhy, or west of California. You hope you will be instantly vaporized if the bomb falls while you are waiting for a bus downtown. But it is not that simple. The smallest warhead aimed at Chicago is 50-megaton, not one-megaton, and there are over 200 of them. All of these will arrive within 15 minutes, and there will be no warning - for no one will believe they are coming.... You will not be vaporized, only some will. Most people will be maimed and burned. Many will die of asphyxiation in the flames. Those who survive their torn limbs and burns will die of starvation. There will be no bandages, no food, no heat, no roads - and no help will come. The toll over the next few years will approach 15,000,000. The dust which the wind carries East will cause the complete evacuation of Ohio, New York, Pennsylvania. Illinois north of Springfield, and parts of Wisconsin, Indiana, and Michigan will not be habitable for the next 2000 years.